I was in the mood to make flowers- only I didn’t want to make just any flower. 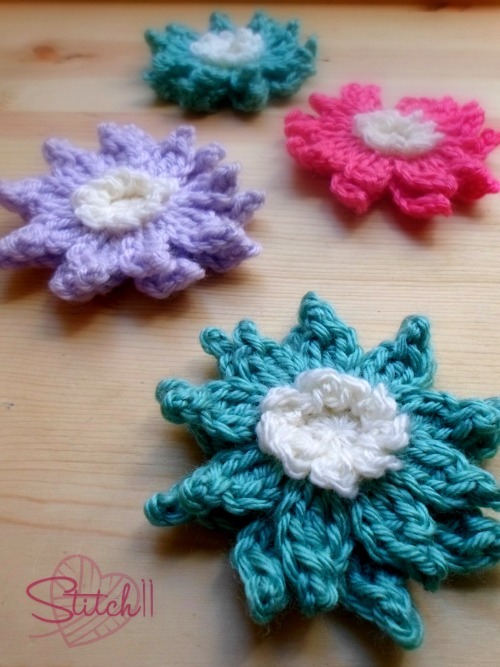 I wanted to crochet a flower that I have never seen crocheted before. The Water Lily looks a lot like the Water Lotus, but when you really research you will see the difference between the two easily. I decided on designing a Water Lily because the lilies grow in a variety of colors… allowing my color options to be endless. Test out my free pattern and let me know what you think! Round 3: Slip stitch into the front loop from round 1. **CH 2, slip stitch into same front loop. Slip stitch into next front loop. Repeat 8 more times. Finish off and change colors. Attach yarn to the front loop of round 2. Round 4: Working in the front loops only. **CH 3, TRE into same front loop.CH 2, Slip stitch into the top of the TRE. CH 3, Slip stitch into same front loop. Slip stitch into next front loop. Repeat from ** 8 more times. Round 5: Slip stitch into the back loops from round 2. Working in the back loops only. **CH 4, DTR into the same back loop. CH 2, Slip stitch into the top of DTR. CH 4. Slip stitch into the same back loop. Slip stitch into the next back loop. Repeat from ** 8 more times. This would be great to make with colored plastic bag material so it would be waterproof for outside use! Need a lilypad to go with.